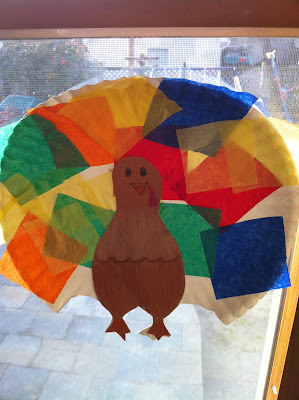 Jack...A turkey he made at Sunday School. He was proud. So was I. He gobbled. I laughed. 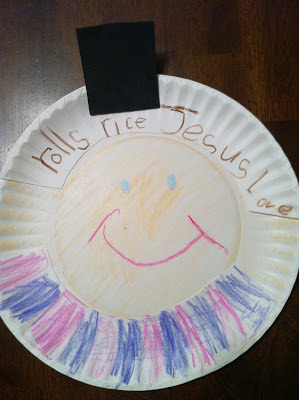 From Hadley....A card she made at school. This is amazing. This fills my heart with gratitude. This is Thanksgiving. From Cameron...A Pilgrim. 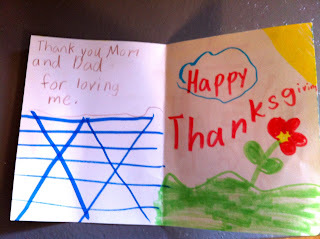 She wrote what she was thankful for across the cap. I think my job with Cameron is done - I think she's pretty much got life figured out. I know this is probably an unusual comment. I enjoy following your blog. Unfortunately, over the Thanksgiving holiday, my dad had bypass surgery. It was pretty scary for all of us. While we were waiting 5 hrs. during the surgery, the wait was getting old and we were getting impatient. So, I started reading your blog posts to my mom and sis. Pretty soon, they were laughing and ready to pee in a diaper. Other families who were waiting kept saying "I don't know what you are reading, but we could use it too." So, if anyone questions why you write your blog, just say you have provided comic relief for the needy. Wow! That is quite a compliment! Thank you so much. I just saw this comment today so I apologize for the late response. I hope your dad is doing well and that you enjoy your holiday. Again, thank you so much for reading. Thanks, my dad is doing great. Again, thanks for the blog. It has been very entertaining!